Tag line: "A world beyond imagination"
Cinematographer Howard Hall, who also took on directorial duties for 2009’s Under the Sea, is no stranger to underwater photography, having worked on such projects as the documentary shorts Island of the Sharks (in 1999) and Deep Sea (in 2006), as well as a number of TV series stretching as far back as the ‘60s program The American Sportsman. For Under the Sea, Hall explored the waters of New Guinea, Australia, and Indonesia, and in so doing presents some of the most breathtaking underwater imagery ever captured on film. 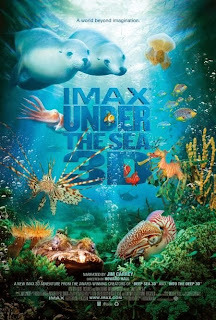 Narrated by Jim Carrey, Under the Sea was originally presented in IMAX-3D, which, considering how incredible it looked on my meager set-up at home, must have made for a stunning experience. Taking his cameras to the ocean floor, Hall (who shot the entire film himself) observes the creatures that inhabit this strange and wonderful locale, a place thousands of species call home. 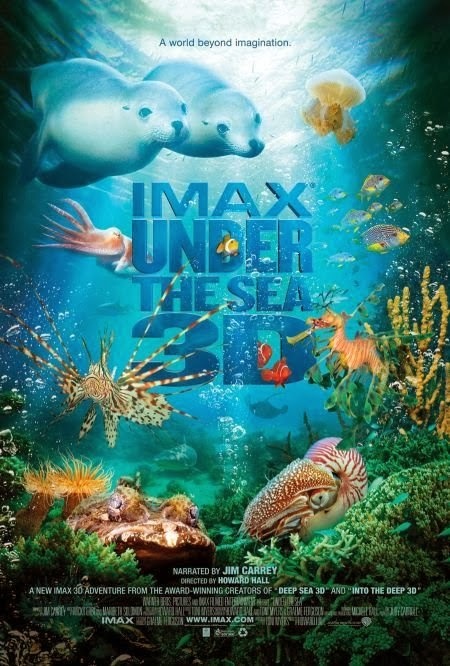 Over the course of the movie, we experience the bizarre (looking for protection, a carrier crab picks up a jellyfish and proceeds to carry it on its back), the amazing (male reef squid stand guard over translucent egg cases, which illuminate the entire area), and the beautiful (there are hundreds of multi-colored coral formations, each one more exquisite than the last). As I’m sure you’ve gathered by now, I’m a sucker for underwater expeditions (Ghosts of the Abyss, Aliens of the Deep), and Howard Hall’s Under the Sea ranks as one of the most spectacular I’ve ever seen.